I know, I featured a red t-shirt of the band recently. 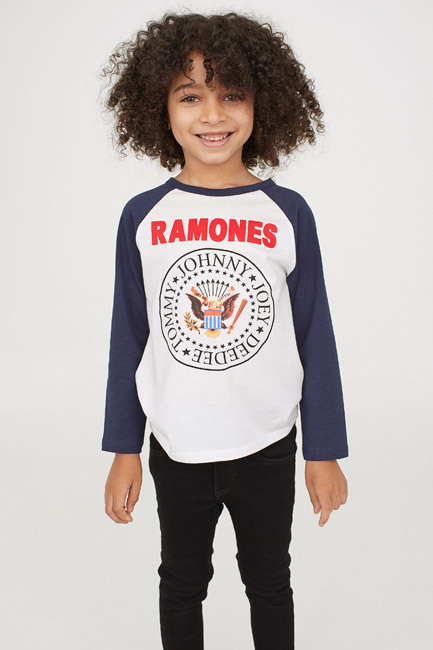 But now this Ramones long-sleeved top at H&M has appeared on my radar. Love it too. In fact, if you want something cool and retro that works at this time of year, this could be for you. Or at least, for your child. Let’s face it, despite the logo being everywhere, The Ramones are still a very hip band and the logo is still cool too. It works really well on this retro long-sleeve top in white and navy blue, with the colourful design and band name very much front and centre. Of course, it is H&M and that means pretty cheap too. £7.99 in fact, with sizes for ages from 1 through to 10.